Last week's annual meeting of the Baptist General Convention of Missouri was a great time of worship, preaching, and fellowship. It was held at Fee Fee Baptist Church, which is the oldest Protestant church West of the Mississippi. We had exciting special music, especially from the guest choirs that included that of the host church and a couple of African-American Baptist choirs from the area. The times of fellowship were, as always, great with a friendly spirit filling the place. We also heard reports from the various Missouri Baptist ministries and the very exciting things God is doing through them. New officers were elected and I am sure that Randall Bunch will do an excellent job as the next president. The preachers were each thought-provoking and they gave us a very strong focus on Christian unity and missions. 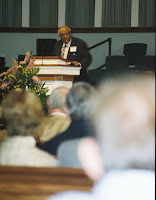 Jim Hill urged us to "get over ourselves" and "acknowledge the presence of God." He also argued that changes in technology and travel give us more missions opportunities than previous generations have had. Scott Harrison told stories of missions experiences that touched him as he encouraged us to not allow minor issues to distract us from telling others about Jesus. He pointed to Mark 9:16 where Jesus scolded his disciples by asking "What are you arguing with them about?" Wallace Hartsfield stressed the importance of us removing ourselves from the forefront in order to become servants and allow God to work through us. He also talked about the important contributions different cultures can teach others, which he demonstrated with the differences in how whites and African-Americans sing hymns. William O'Brien spoke twice about important changes occurring around the world that impact missions. He talked about the impact of the growth of Christianity in Africa and Asia, and about churches in America being "domesticated" (which is bad). Ronald Bobo developed his passionate message from the children's game hide-and-go-seek as he argued that Jesus is declaring, "Ready or not, here I come!" Harlan Spurgeon argued that it was not enough to know God's will but that we must work to follow and do God's will. He has been a very good leader during his two terms as president and we are fortunate that he will remain on the board. Additionally, Jose Samol, president of the Guatemala Baptist Convention, brought remarks to update messengers and guests on the BGCM's partnership with the Guatemala Baptist Convention. His translator, BGCM Missions Mobilization Team Leader Gary Snowden, also spoke at the BGCM's annual missions banquet that raised several thousand dollars for Guatemalan Baptists. It was exciting to hear more about the ministry work and see photos. You can watch the sessions free online here. In addition to the photos below, you can also see more photos from the meeting here. You have posted a very good content of faith & God. Now you can get involve yourself in the faith debate, discussing traditions of all religions, virtues and belief. Visit http://www.thefaithdebate.com/ and upload all videos and audios related to this blog after creating your profile at free of cost. Thanks for passing on the site.